Critical Element 3.1 of the U.S. Department of Education’s Assessment Peer Review Guidance calls for evidence of adequate linkage between a state’s alternate assessment for students with the most severe cognitive disabilities and the state’s academic content standards. States must also show that the cognitive complexity of the test is appropriate for the population of students with disabilities who are tested at each grade. To conduct this independent study on the state of Texas’ behalf, WestEd alignment specialists reviewed all items for grades 3–8 and high school on the 2016 State of Texas Assessments of Academic Readiness (STAAR) Alternate 2 in reading/English language arts, mathematics, science, English I & II, Algebra I, and Biology. 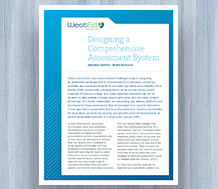 For each item, the WestEd team systematically sought to find one or more standards in the Prerequisite Skills embedded in the Texas Essential Knowledge and Skills that were linked in meaningful ways to that item. Results from the linkage study supported the Texas Education Agency’s technical documentation required for the 2016 Peer Review process.